Posted on 8, September 2016 by EuropaWire PR Editors | This entry was posted in Automotive, Germany, Industrial, Management and tagged H.E. Uhuru Kenyatta, Kenya, Polo Vivo, Thomas Schäfer, Volkswagen. Bookmark the permalink. Thomas Schäfer, Managing Director of Volkswagen South Africa and H.E. 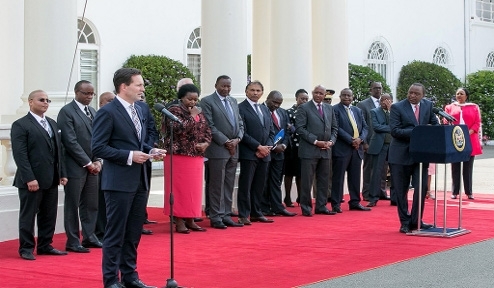 Uhuru Kenyatta, President of Kenya addressing media after the signing of an agreement to start the production of the Volkswagen Polo Vivo in Kenya at the end of 2016. Nairobi / Wolfsburg, 08-Sep-2016 — /EuropaWire/ — Volkswagen continues to drive forward with the regionalisation of the global automotive business. The brand is planning to start CKD production of the Polo Vivo in Kenya at the end of 2016. An agreement to that effect was signed in Nairobi today by the Kenyan Government and Thomas Schäfer, Managing Director of Volkswagen South Africa in the presence of H.E. Uhuru Kenyatta,President of Kenya. This is an important step by the Volkswagen brand towards engaging further in new emerging markets – with the right products and know-how from the region. Volkswagen is expanding its commitment in Africa with local production of the Polo Vivo in the Kenyan city of Thika near Nairobi. The project which will be jointly realised with the importer DT Dobie, will be Volkswagen’s third production facility in Africa – alongside the South African factory and a local production facility in Nigeria. It is planned to build up to 5,000 units of the Polo Vivo per year at the plant operated by Kenya Vehicle Manufacturers (KVM) from 2017. “We are taking the successful Polo Vivo from South Africa to Kenya to leverage the enormous growth potential of the African automobile market and participate in its positive development. This compact model is the best-selling car in the Sub-Saharan region – so it is the ideal entry model for the promising Kenyan market,” Thomas Schäfer commented at the signing ceremony. “With this move, we are strengthening the brand’s overall position in Africa and taking an important step towards expanding our commitment in the region,” Schäfer continued. In addition to production of the Polo Vivo from the end of 2016 it is also planned to establish a local training centre to qualify production workers and provide further training. The centre will initially focus on the needs of the Volkswagen production team. Later on it is planned to provide basic training for young people to learn general industrial skills, thereby increasing employment opportunities in the region in general. Kenya is one of Africa’s emerging markets. The country plays a prominent role among East African nations and with a GDP of some US$ 63 billion, it is one of the strongest economies in the East African Community (EAC). Kenya is also an important transit country for trade throughout East Africa. The good economic relations between Kenya and Germany also benefit from ongoing strategic political support. A long tradition links Volkswagen and Kenya: back in the 1960s, Volkswagen assembled the Beetle in Kenya. The brand is now returning to the country, initially with the Polo Vivo. It is also planned to review local production of further Volkswagen models should the new vehicle market show positive development. Volkswagen of South Africa (Pty.) Ltd.